It supposed to give 5 SP for every mind, body, dark, light or debuff status effect you apply but it simply doesn't work (animation still plays though). I had fatewarper yuki-onna with afflicter who used haunt (-25 SP), pink whisper (-25 SP) and vitiate (-30 SP) and she had only 20 SP left by the end of the turn. So no SP recovery from applying charm, def and evd down. And quick question - if afflicter was working properly, would it make things like vile dance, poison host or any AoE debuffs basically free or would it only restore 5 SP? I'm gonna need a save file for this one unfortunately, as I can't get a repro of it: those abilities work as expected for me: Afflicter recovers SP as expected. And yes, it triggers per target. If you have good cunning, it can make AE status effect abilities much, much cheaper to use. Sadly that run is already over and dungeon.xml is gone. Will tower.xml files be sufficient? Well I sent them on ferretdev.org@gmail.com just in case. Hmm.. still haven't gotten the files, though unfortunately, the data recovery process for a dead save game is probably too invasive to work anyway for reproducing a bug. I appreciate the thought regardless, if it happens again and you get a living save file, let me know. Thanks for the report. Oh, there the files are. Well, at least I was able to get them, but yeah, dead save files're pretty limited use for this unfortunately. Ok this time when I got my hands on a debuffer with afflicter it worked like a charm. Not sure what was the deal with previous one. Probably should've given you more details on that. It happened during a corpse encounter. 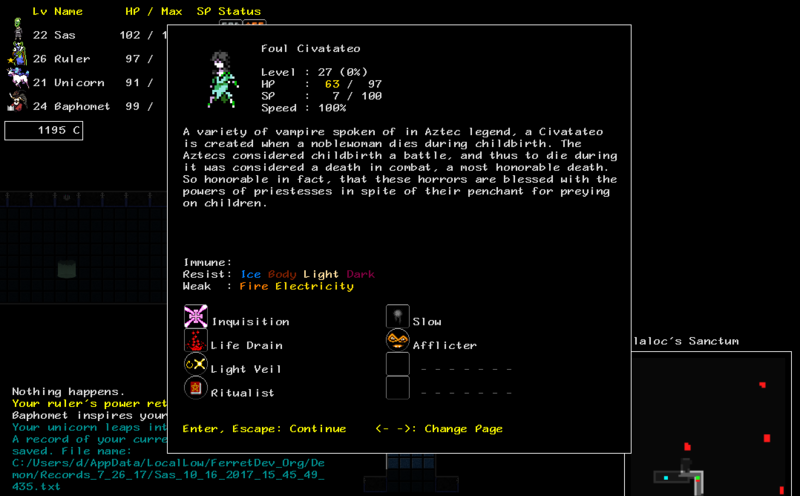 I just got that fatewarper yuki-onna and was eager to test it in combat. She used all those abilities that I described earlier on Ikiryo who spawned from the corpse. Also I linked with regular yuki-onna from that same corpse just to recycle her later for credits. But when I noticed that my debuffer wasn't regaining any SP I put her in the pocket and never summoned again. Oh and I got afflicter on her via revelation. The civatateo gestures at you. Your unicorn leaps into action! Gottem! Sent save files as well. ugh, bad me. I found it. Since nothing actually resists Debuffs, I was lazy and did not actually set the resistance type of some Debuff effects to Debuff type. Of course, other Herbie forgot that and was blithely checking that to see if Afflicter should apply... arooo. Fixed in next build, and I'll check the rest too.